FuJo’s Eileen Culloty was one of the speakers at recent event on news literacy organised by Media Literacy Ireland. Below is a version of her talk where she outlines reasons to be sceptical about news literacy as a solution to current problems with online disinformation. Like so many others who are concerned about journalism, I’ve spent a lot of time thinking and reading about news literacy over the past two years. But instead of going into the nitty-gritty of various research studies, I want to outline the broad challenges I see for the development of news literacy. Multiple Literacies: The first is a practical concern about over-stacking literacy education. Literacy education is increasingly viewed as a panacea for a wide-range of problems. So while we’re here this evening to talk about news literacy, we could just as easily be having a discussion about information literacy, digital literacy, or media literacy. And beyond media, there are reasonable calls for promoting environmental literacy, social literacy, emotional literacy, and so on. Undoubtedly, there is merit in each of these calls for new literacies, but we need to be realistic about what can be delivered and about what can be achieved from the perspective of the individual citizens who are supposed to benefit. Whether we’re talking about adults or young people, it’s not realistic to expect them to proceed through a parade of literacies. Moreover, there’s a risk of creating an overly didactic and confusingly piecemeal approach to what is essentially about empowering citizens. In my view, one way out of the multiple literacies problem is to focus on the core area of critical reasoning; skills that empower citizens to think clearly, to express themselves clearly, and to make informed judgements to the best of their abilities. On this view, news literacy is just one aspect or sub-set of a much larger goal of empowering citizens. Socialisation: The first is about socialisation and how we are socialised to value news. For those of us who grew up in the mass media era, we were not formally taught about the importance of journalism. Instead, we assimilated this idea from daily life; from parents telling us to be quiet because ‘the news is on’ and from teachers coming to school with their newspapers every morning. Of course, many parents and teachers still consume news, but children don’t necessarily see it because it’s on smartphones where the news is interspersed with everything else we do online. Even though there is more news than ever more, the visibility and status of news has diminished. The loss of the old socialisation is not easily recovered so we need to think creatively about ways in which the importance of news can be re-asserted through daily routines. For example, there’s a great initiative in DIT (CLiC News) where their journalism students write news articles for schools and the children get to comment and respond to those articles. Here, multiple literacy goals are combined as the school children engage with news and current affairs while developing skills in reading and writing as well as civil participation in online comments. Older Consumers: Another issue concerns the needs of older citizens. Literacy education is typically focussed on the young; partly because the young are easier to access with educational programmes and the young are assumed to be more vulnerable. That’s not necessarily true of digital media and digital news. After all, it is primarily adults, not their children, who are responsible for re-sharing disinformation about politics, health, and climate change. Those who believe in and propagate disinformation are the most important stakeholders in the “fake news” problem. But an increased effort towards fact-checking and verification will not necessarily address those who are already sceptical about experts and feel alienated from ‘elites’. Moreover, the rapid pace of technological change has left many adults behind and I don’t just mean the elderly and people who are not online. I’m also thinking of people, perhaps in their late 30s or 40s, who have smartphones and Facebook accounts, but are not confident with technology and are not savvy, as many young people are, when it comes to telling the difference between a news article and a spoof article. Without addressing the lifelong literacy needs of older age-groups, there is a real risk of allowing a generation gap to escalate. A Realistic View of Journalism: Finally, I think we need to have a realistic view of journalism; about the various ways it is practiced and about how is perceived by the wider public. Because those of us interested in the future of journalism tend to emphasise the best of journalism. We talk about the social and democratic goods that quality journalism delivers and we discuss the fourth estate and the importance of holding power to account. But that’s not necessarily what most people bring to mind when they think about journalism; they are as likely, if not more likely, to think about sensationalism, bias, and intrusions on privacy. If we don’t honestly address concerns about poor journalism (whether by traditional or digital media), then any effort to promote the importance of journalism will seem hollow. In summary, there clearly is a need for news literacy, but how it can be delivered and what it can achieve are not as clear. 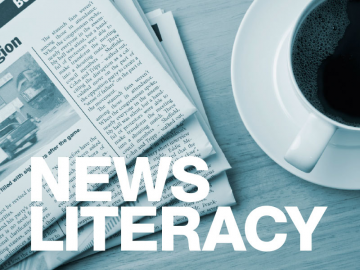 With declining trust in news media and with attacks on journalism increasing worldwide, we should be critical when thinking about the claims of news literacy because the risks we’re facing demand robust and effective responses.